Absolute Uninstaller is similar to standard Windows Add/Remove program but more powerful.When we install a Software it copies some of its Files usually in C:\Program Files , C:\Windows\System32 , Registry .If we uninstall a Software from Add/Remove Program ( Win+R –> appwiz.cpl).It removes some Files from C:\program Files only.It will not remove the Softwares Supporting Files and Folders from System32 or Registry.The more junk files your computer have ,the slower it runs. Uninstall Manager can wipe off all the junk files clearly in seconds.It offers a more user-friendly way to remove unneeded applications and to improve your computer efficiency. The Standard Add/Remove Program often can’t uninstall applications completely .It often leave files on the hard drive ,associated desktop icons, Start menu entries and keys in the registry. Big registry and large number of unnecessary files make the system slower and slower. 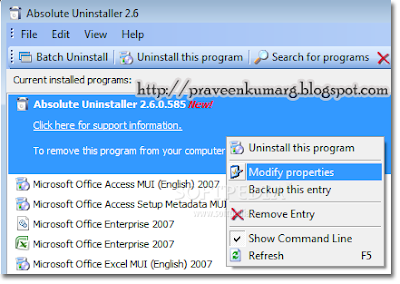 Uninstall Manager can clear them in seconds! Mark new program installed with red “New!”.